1) When the nations round about heard that the altar had been rebuilt and the sanctuary restored as before, they were enraged. COMMENTARY: Partly because a successful rebellion on their neighbor’s part means that they’re vulnerable to attack. And a restored temple has huge strategic value when you weigh the power of the morale boost it gives. People who feel that God will take their side are darn near unstoppable. And if He really does take their side, they really are. Part of their rage might also be envy that Judah’s getting away with what other nations didn’t, and remorse that they didn’t rise up to defend their own religion projected onto those who did. Human beings resent other people doing whatever we secretly suspect we should have done. And part might be justifiable fear. Judas by now has built a reputation for being about as subtle as the hammer he’s named for, smashing whoever and whatever gets in his way. 2) So they decided to destroy the descendants of Jacob who were among them, and they began to kill and eradicate the people. COMMENTARY: So they kill the innocent out of the fear that these might turn violent against them out of solidarity with their kin. But probably these nations wouldn’t even have registered on Judas’s radar if they’d left their own Jews alone. And those Jews who sided with the Maccabees would simply have left to join him. Instead, these people let their fear make what they feared come true. This rings true for me in these troubled times, when so many Americans want to cast out our Muslim neighbors, or put restrictions on them incompatible with our constitution, things that make the lies of fanatics seem like truth. If we don’t take care, we make our own enemies. 3) Then Judas attacked the Edomites at Akrabattene in Idumea, because they were blockading Israel; he dealt them a heavy blow, humbled and despoiled them. COMMENTARY: Blockading is also, of course, an act of war. The text literally said “Sons of Esau” which seems like a nice bookend for “descendants of Jacob”, except that it brings up the story of how Jacob, younger twin to Esau, stole Esau’s heritage by trickery, and is meant here as a taunt. I don’t know about the rest of the world at that time, but the ancient Mediterranean nations saw trickery as admirable. 4) He also remembered the malice of the Baeanites, who had become a snare and a stumbling block to the people by ambushing them along the roads. COMMENTARY: The scholars of the Conference of Catholic Bishops site from which I draw my texts identify both the Edomites and Baeanites as Idumeans. Different branches? 5) He forced them to take refuge in towers, which he besieged; he put them under the ban and burned down their towers along with all who were in them. COMMENTARY: This seems to me too harsh a penalty for highway robbery, but I come from an era in which the Geneva Convention forbade the use of flamethrowers as weapons. As for “putting them under the ban”, this says to me that he would have ignored the Baenites if they hadn’t aggressed against his people, but now he’s going to treat them like Greeks and collaborators. 6) Then he crossed over to the Ammonites, where he found a strong army and a large body of people with Timothy as their leader. 7) He fought many battles with them, routed them, and struck them down. COMMENTARY: The aforementioned scholars say that this, plus verse 8, really should go between verses 36 and 37, but the writer’s getting ahead of himself. Nobody among the scholars seems to know for sure who Timothy is. 8) After seizing Jazer and its villages, he returned to Judea. COMMENTARY: Jazer’s a town on the road between Jordan and Amman. Which means that Judas Maccabee has gone from liberating his own territories to invading others, thanks to the invitation extended by their aggression against Jews in their midst. We will see how that came about in future verses that should have been prior verses. 9) The Gentiles in Gilead assembled to destroy the Israelites who were in their territory; these then fled to the stronghold of Dathema. COMMENTARY: Dathema is somewhere east of Jordan, a day’s journey from Bozrah, but archaeologists haven’t found it yet. COMMENTARY: So now we get the motive belatedly spelled out for us: Judas got a letter asking for help. This passage has had tremendous impact on European history, because Kings and other leaders have used it as justification for conquering any nation that it can claim has mistreated ex-pats of their nationality (whether true or not.) Even Hitler, who as everybody knows despised the Jews, nevertheless used this argument in his propaganda to justify his invasion of most of Europe. And my own nation used it as a reason to invade Grenada. The Tobiads were a prominent Jewish family east of the Jordan. Ironically enough, they were leaders of the Hellenistic Jews that Judas had regarded as traitors. Even more ironically, they were possibly descendants of Tobias, whom you might remember in our studies of Tobit! Or possibly a Tobiah mentioned as an Ammonite and an enemy in another Deuterocanonical book, this one by Nehemiah (but if they were Ammonites, why would they be slain as Jews?) They built their prosperity and power upon the friendship of the Ptolemaic Dynasty, yet some at least appear, by some accounts, to have switched sides to support the Seleucids. And what did it all get them in the end? COMMENTARY: Like bodies, souls can suffer from contagious diseases. This one spread quite quickly. 16) When Judas and the people heard this, a great assembly convened to consider what they should do for their kindred who were in distress and being attacked by enemies. COMMENTARY: They face a momentous decision. In ancient times this woudn’t have even come up—except for the temporary visits of merchants, bards, and diplomats, and the occasional restless individual, folks pretty much stayed in their own territories among their own people. Then Nebuchadnezzar had the idea of breaking up nations in his empire by scattering their citizens widely, in the hopes of homogenizing them and reducing nationalism, thereby preventing uprisings. Others after him did likewise. But the upshot was that instead he created little pockets of ex-pat communities everywhere, sometimes getting even more nationalistic in order to hold onto their identities. So what happens when a community gets attacked by those who surround them? Are you still one nation, even beyond your borders? And does this justify invading other people’s borders, if they contain cousins of yours in trouble? Does this even apply to assimilated cousins like the Tobiads? Whatever they decide here will set a precedent for the rest of history. COMMENTARY: And thus they decided. And so it has been ever since. 18) He left Joseph, son of Zechariah, and Azariah, leader of the people, with the rest of the army in Judea to guard it. COMMENTARY: Prudent, since they’re not out of the woods yet. After all, Gorgias is still camped nearby. COMMENTARY: Judas doesn’t mean don’t defend the city. He just means don’t provoke trouble without the rest of the army to back you up. 20) Three thousand men were allotted to Simon to go into Galilee, and eight thousand men to Judas, for Gilead. COMMENTARY: Interesting that Simon would get the smaller force. But since he’s the smartest of the brothers, he’s the most likely to put what he’s got to the best use. 21) Simon went into Galilee and fought many battles with the Gentiles. They were crushed before him, 22) and he pursued them to the very gate of Ptolemais. About three thousand of the Gentiles fell, and he gathered their spoils. 23) He took with him the Jews who were in Galilee and in Arbatta, with their wives and children and all that they had, and brought them to Judea with great rejoicing. COMMENTARY: So at this point their goal is repatriation, not conquest. And yes, Simon managed splendidly with his smaller army. For the record, Arbatta, AKA Narbatta, is “probably south of Mt. Carmel”. More presents lie in the earth waiting for archaeologists to unwrap them. COMMENTARY: Nabateans were a kind of Arab known for their merchants and caravans. They built Petra as their capital—that famous sheltered city carved into rock. Anyway, merchants were the chief source of news beyond one’s borders, and also likely to stay neutral in any fight, as they might want to do business with both sides. COMMENTARY: It helps to know where the people you want to rescue might be. At first I thought that “shut up” meant beseiged, but as it turned out they were prisoners there, awaiting execution at the same time as strongholds elsewhere were attacked. 28) Thereupon Judas suddenly changed direction with his army, marched across the wilderness to Bozrah, and captured the city. He put every male to the sword, took all their spoils, and set fire to the city. COMMENTARY: Rescuing those certain to die took priority over aiding those who at least stand a chance of defending themselves. Leaving the noncombatants alive might seem a mercy if not for taking everything from them and leaving them unable to fend for themselves, which means that the women and children would all have to become slaves. But an army of 8,000 needs a lot of provender and generals often relied on looting to keep supplied. 29) He led his army from that place by night, and they marched toward the stronghold. COMMENTARY: The stronghold being Dathema. At this point they’re sacrificing sleep in order to getting as close to showing up two places at once as possible. 30) When morning came, they looked ahead and saw a countless multitude, with ladders and machines for capturing the stronghold, beginning to attack. COMMENTARY: Hence the necessity of the all-night march. 31) When Judas perceived that the struggle had begun and that the noise of the battle was resounding to heaven with trumpet blasts and loud shouting, 32) he said to the men of his army, “Fight for our kindred today.” 33) He came up behind them with three columns blowing their trumpets and crying out in prayer. 34) When the army of Timothy realized that it was Maccabeus, they fled before him, and he inflicted on them a great defeat. About eight thousand of their men fell that day. COMMENTARY: Again, they seized the enemy’s morale. If Timothy’s army had realized that they were up against exhausted men who had already fought one battle and had no rest since, they might have stood their ground and prevailed. But by now the name of the Maccabees had become a weapon by itself; nobody stuck around to test their actual mettle. 35) Then he turned toward Alema and attacked and captured it; he killed every male, took spoils, and burned it down. COMMENTARY: Some manuscripts say Alema, some Maapha, which might be Mizpah. 36) From there he moved on and took Chaspho, Maked, Bosor, and the other cities of Gilead. COMMENTARY: These cities apparently don’t merit notes as to where they are (beyond being in Gilead) or what other names they might have. And, well, “other cities of Gilead” are clean out of the running. 37) After these events Timothy assembled another army and camped opposite Raphon, on the other side of the wadi. COMMENTARY: A wadi is a canyon carved by periodic desert flash-floods. Sometimes they’re also all that remains of prehistoric rivers before desertification set in. Sometimes they still have rivers or streams in them, which usually flow only part of the year. 38) Judas sent men to spy on the camp, and they reported to him: “All the Gentiles around us have rallied to him, making a very large force; 39) they have also hired Arabians to help them, and have camped beyond the wadi, ready to attack you.” So Judas went forward to meet them. COMMENTARY: Now we get the specification that this is a flowing wadi. This matters because that means it’s the wet time of the year, which means that a flash-flood could thunder through it at any moment. For those of you unfamiliar with desert flash-floods, deserts usually don’t get gentle rains; those come from air currents slowed and moderated by forests. Deserts get great, sudden, lightning-flashing storms that pound down a ton of water all at once and then just as suddenly end. This can often happen so many miles away that you don’t even see the clouds, but since the hard-baked soil of the desert isn’t made absorbent by layers of shed organic matter, all of that water can come hurtling downslope at a killer speed, ripping up boulders and anything else in its wake. They have been known to smash cars to bits, let alone people. So crossing the usually shallow waters of a wadi river is a gamble. If the Maccabee brothers hesitate, anxiously weighing the dangers, Timothy can catch them off-balance. COMMENTARY: You don’t worry so much about floods if you believe that God is on your side. 43) He was the first to cross to the attack, with all the people behind him, and all the Gentiles were crushed before them. They threw away their arms and fled to the temple enclosure at Carnaim. 44) But Judas’ troops captured the city and burnt the temple enclosure with all who were in it. So Carnaim was subdued, and Judas met with no more resistance. COMMENTARY: One has to remember that temple enclosures (the areas around a temple) were built as fortresses. 45) Then Judas assembled all the Israelites, great and small, who were in Gilead, with their wives and children and their goods, a very large company, to go into the land of Judah. COMMENTARY: Again, the goal is repatriation. 46) When they reached Ephron, a large and strongly fortified city along the way, they found it impossible to go around it on either the right or the left; they would have to march right through it. COMMENTARY: Ephron is a very large and strategic city, on high ground above two tributaries of the Jordan River. Not only its size but also its position made it impossible to go around. As to why they can’t just go back the way they came, an army passing through once can be good for business, if they pay for their supplies, but passing through twice is ruination and might cause unnecessary skirmishes. 47) But the people in the city shut them out and blocked up the gates with stones. COMMENTARY: That’s the downside of a ferocious reputation. 48) Then Judas sent them this peaceful message: “Let us cross your territory in order to reach our own; no one will harm you; we will only march through.” But they would not open to him. COMMENTARY: I can see both sides to this. I don’t know if I’d trust the Maccabee army, either, with the reputation that they have. After all, we can’t assume that the Ephronites know their goals. But from Judas’s point of view, he’s really trying to be peaceful and diplomatic. 49) So Judas ordered a proclamation to be made in the camp that everyone should take up positions where they were. 50) When the men of the army took up their positions, he assaulted the city all that day and night, and it was delivered into his hand. 51) He put every male to the sword, leveled the city, took spoils and passed through it over the slain. COMMENTARY: “Passed through it over the slain” means that he left them there to rot. The lesson I’m supposed to get from this is that Ephron should have let them pass through peacefully, and that people shouldn’t cross the Army of the Lord. The lesson I’m actually getting is, “Come on, this is exactly the sort of thing that gives you such a bad reputation, Judas!” Whatever happened to eye for an eye justice? You know, where you take no more than what was taken from you? Did every single man and boy have to die? I confess that this is probably not what you’d hear from somebody more qualified to teach about scripture. But I promise at least that if I don’t believe something, I’m not going to lie and say that I do. 52) Then they crossed the Jordan to the great plain in front of Beth-shan; 53) and Judas kept gathering the stragglers and encouraging the people the whole way, until he reached the land of Judah. COMMENTARY: This, on the other hand, I do respect. He understands that at this point he’s not just marching soldiers, he’s evacuating civilians not trained to cross great distances on foot, many of whom would have been children (children always greatly outnumbered adults in the ancient world, many of whom would not make it to adulthood.) Also they’re carrying or hauling whatever earthly possessions they had left, in order to make a new life for themselves in Judah. 54) They ascended Mount Zion in joy and gladness and sacrificed burnt offerings, because not one of them had fallen; they had returned in safety. COMMENTARY: That much is indeed worth celebrating and thanking God for. COMMENTARY: Exactly what Judas told them not to do. Judas knows strategy, Jonathan has a reputation for trickery, and Simon is the wisest of the brothers; these men know what they’re doing. On the other hand, guys who think that war’s all about the glory and polishing your resume are best left behind, guarding the women and children; brains aren’t part of their arsenal. 58) They gave orders to those of their army who were with them, and marched against Jamnia. COMMENTARY: Jamnia, AKA Yavneh, capitol of Azotus AKA Ashdod. 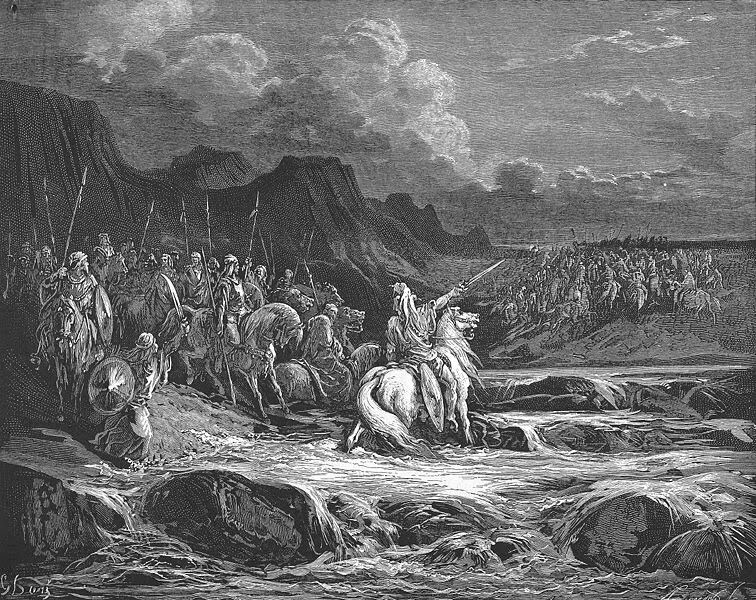 59) But Gorgias and his men came out of the city to meet them in battle. COMMENTARY: Oops—it’s occupied by the best and brightest of the Seleucid army! 60) Joseph and Azariah were routed and were pursued to the frontiers of Judea, and about two thousand Israelites fell that day. COMMENTARY: Well, they did make a name for themselves—as idiots whose folly cost lives. 61) It was a great setback for the people, because they had not obeyed Judas and his brothers, thinking that they would do brave deeds. COMMENTARY: I can just picture the storyteller raising an eyebrow to glance at any hot-blooded young men in the audience. 62) But they were not of the family through whom Israel’s deliverance was given. COMMENTARY: Now that was probably added to bolster the Maccabeean claims to the throne. 63) The valiant Judas and his brothers were greatly honored in all Israel and among all the Gentiles, wherever their name was heard; 64) and people gathered about them and praised them. COMMENTARY: Adding this right after Joseph and Azariah’s debacle rubs it in. THESE are the guys who made a name for themselves, not you two doofuses! 65) Then Judas and his brothers went out and attacked the Edomites in the land toward the south; he took Hebron and its villages, and he destroyed its strongholds and burned the towers around it. COMMENTARY: Finishing up what he started with the blockaders. 66) He then set out for the land of the foreigners and passed through Marisa. 67) On that day some priests fell in battle who had gone out rashly to fight in their desire to do brave deeds. COMMENTARY: Although of a priestly family, Judas is primarily a warrior. He knows that some people need to be primarily priests, stay off the battlefield, and do what they do best.